I haven’t been able to get enough Indian or Middle Eastern food lately. I’ve been craving the stuff. Everything from potato aloo, to saag paneer, to all kinds of curries and different sauces and spices. I think that is one of the things I love about that cuisine, and it is getting to the point where it is competing with other cuisines I love so much such as Thai and Mexican. As you recall, I recently made a batch of shawarma spice seasoning, only to be used, for the most part, this recipe. 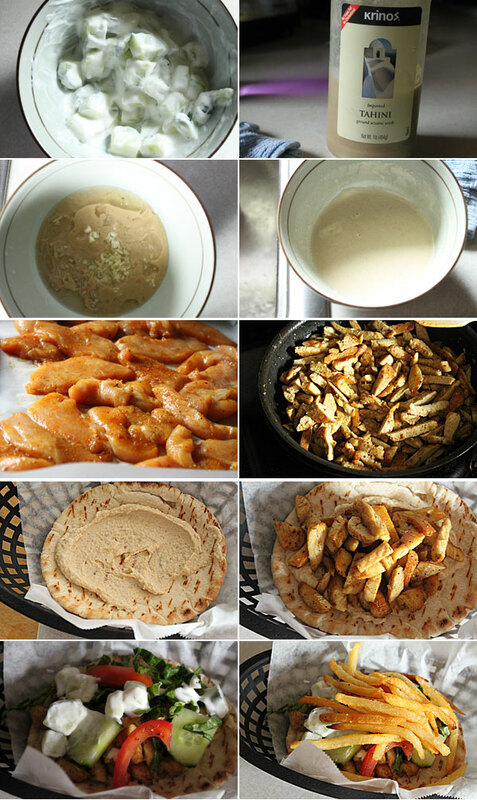 Chicken shawarma is something you need to make, and traditionally done over a spit, I decided to bake mine as the weather on this particular day was not in my favor. Shawarma can be many different types of meat, but it essentially relates to a sandwich. 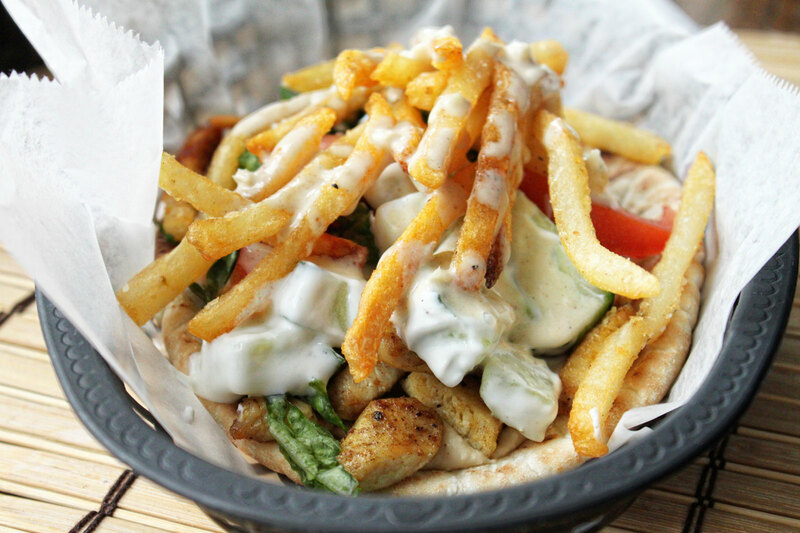 Think of your favorite gyro place where they are slicing meats from a spit, and placing it inside of warm pita or flatbread, along with sauces and vegetables. That’s shawarma, and this is my take on it. Did I mention my entire family was totally in love with this? OK, let’s get this going. Now you have options here. You can go with adding the seasoned strips to a skewer and adding them onto a grill, or you can bake them, as I did. You decide. Start by marinading your chicken. To a mixing bowl, add the chicken, and the oil. Toss to coat, then add in the shawarma spice mix. Toss again to make sure all of the chicken is coated. Cover and refrigerate for at least two hours. During this time, prepare your tzatziki, hummus, and tahini sauce. They all go pretty quickly, and can be used throughout the week. That’s always a great thing. Add the chicken to a baking sheet, and cook for about 25 minutes, or until the chicken is cooked. Once cooked, let it cool slightly, then chop into bite sized pieces. Keep the oven on, and cook your french fries. Heat a skillet on high heat, then add in the chicken, to get a nice sear on the pieces, tossing along the way. Once you get a nice sear, remove from the heat, and set aside until you are ready to make your sandwich. Take your warmed pita and smear on the hummus. Top with pieces of the chicken, drizzle on the tahini sauce, then top with the tomatoes and cucumbers. Add a couple of dollops of tzatziki sauce, the top with the french fries and drizzle with some more that tahini sauce. Now you are ready to dig in. Fold that pita, open wide, and take this bad boy on. This chicken shawarma is so good, and the entire flavor combination just makes this an awesome one. The chicken itself is so warm and addicting in the spices, then you get that creamy hummus, and the garlic tahini. Whoa, this one is great, and again my entire family devoured them. A must make if you are looking for great all-around Middle Eastern flavors and a killer sandwich to boot. Hope you enjoy!